One little bunny hopping in the snow. Along came another, and he said "Hello!" Hop hop hop and away they go. Along came another, and he said, "Hello!" End with: It's a bunny party! 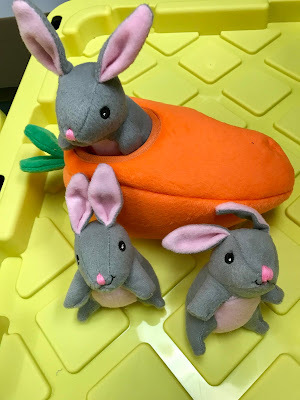 You could use any stuffed bunnies you have handy, but since I am a developing a Forest Friends theme from scratch for an entire library system, I invested in this bunny and carrot set from Amazon. It is actually a dog toy set and the bunnies squeak if you pinch down too hard.